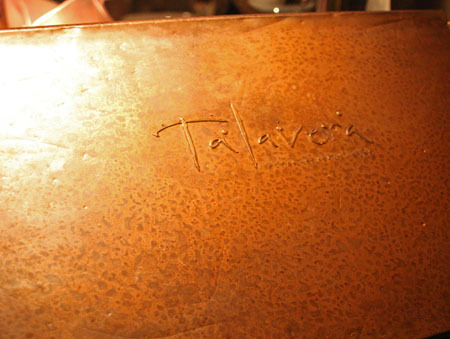 Talavera Restaurant Four Seasons Troon North Menu. Photography by K&S Media. 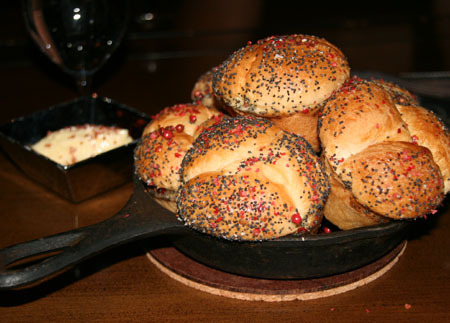 Talavera at Four Seasons Troon Arizona North Bread Popovers. Photography by K&S Media. Talavera at Four Seasons Troon North Arizona Cocktail. Photography by K&S Media. 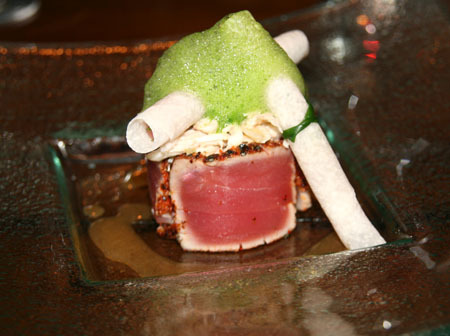 Tuna appetizer at Talavera Four Seasons Troon North Arizona. Photography by K&S Media. Jalapeno cocktail at Talavera Four Seasons Troon North Arizona. Photography by K&S Media. 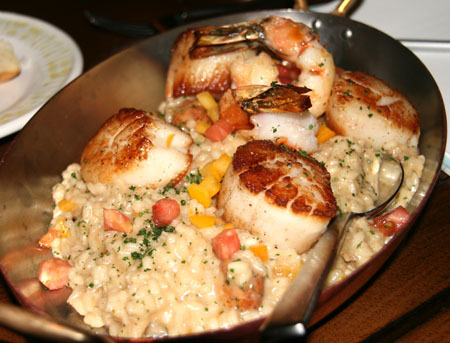 Scallop risotto at Talavera Four Seasons Troon North Arizona. Photography by K&S Media. Lobster at Talavera Four Seasons Troon North Arizona. Photography by K&S Media. I have drinks at Onyx at The Four Seasons, prepared by cocktail master and assistant manager Alex Ramos. I ask Ramos to whet my appetite with a prickly pear margarita. 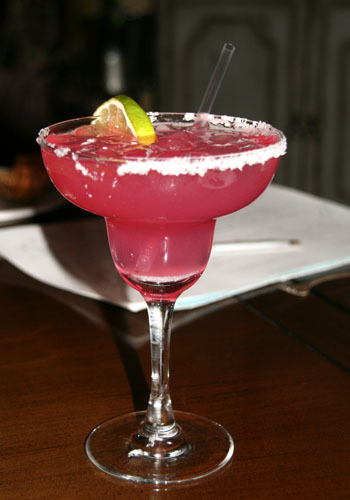 It comes to the table a bright magenta colour, perfectly chilled, and delightfully tart and sweet. I also try ‘the wildflower’, dressed with a Jamaica flower, the cocktail is completely unique. Expressive floral notes hit my mouth instantly while fruit forward zesty orange, smooth out the drink. “I recently won the 2010 taste of the nation, people’s choice with ‘Austin Nights’,” Ramos tells me describing the elements of his winning cocktail that he brings me next. 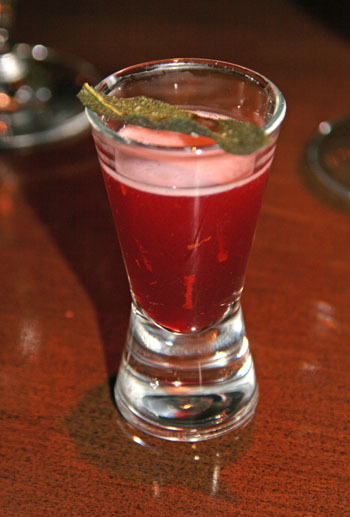 I am intrigued when the tiny shot glasses are brought to the table with a sliver of jalapeno dancing on the rim. The soft sweetness of the silver tequila and agave nectar, perfumed by the tang of jamaica, finished with a mild but ever so pleasant zing of the jalapeno pepper is a surprising, but well composed cocktail. At our table, buttery pink peppercorn popovers beg for nothing, no butter, no accoutrements, simply break them apart and enjoy their silky, light texture. Sweetbread croutons, roasted corn and lobster. 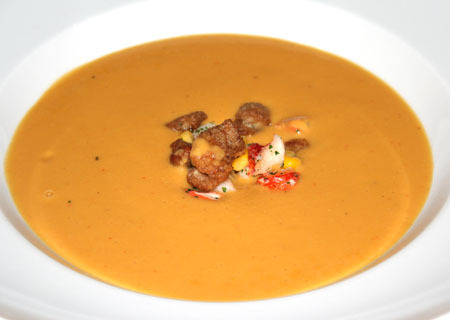 The luscious silky soup with nice chunks of lobster meat was a nice appetizer to start the meal. Jicama, yuzu vinaigrette and iceberg foam. Chili flakes and lime oil on the crust on the Ahi lend a nice heat to the dish. The sweet jicama is a nice foil to the spice. A trio of oysters Trio of oysters (with creole remoulade, agave bbq, and wasabi caviar). Crispy oyster, baked oyster and raw oyster. Great flavour on this trio. A take on Spanish paella, Executive Sous Chef Jesse Hansen’s version is made with Arborio rice, enormous u8 sushi grade scallops, mussels, and clams. The dish is luscious and rich with the soft perfume of saffron, and perfectly nutty granules of rice. 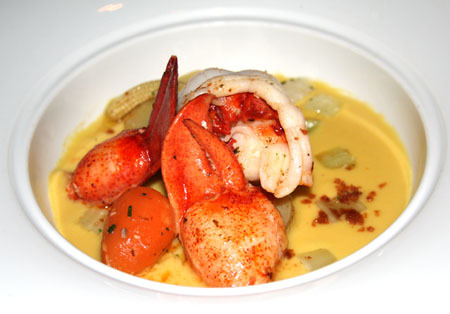 The butter poached Maine lobster in a corn chowder sauce is very meaty, perfectly cooked and sweet. We pair the paella with the mixed mushrooms we order on the side is both rich and earthy. Read more from our article on Greater Phoenix and Sedona in the Summer 2011 issue of City Style and Living magazine, click here.